Step out of your destination marketing shoes and into those of a traveller. Have you ever paused to think about how difficult it is to choose where to visit next? With so many beautiful destination photos and videos filling our feeds everyday, narrowing down the list to one location can seem impossible. How will you decide? High-quality visual content can help visitors make up their minds. When created for a specific audience, it can engage the traveller, influence travel plans, or even change someone’s perception of a region or experience. Research had highlighted the fact that Queensland travellers with a strong interest in food, wine and short getaways had little awareness and understanding of Southern Queensland Country and what the region had to offer. To address this, the destination marketing organization (with the assistance of Destination Think!) created an e-book called A Taste Of Southern Queensland Country, with a specific audience and goal in mind. In order to involve and engage the community, SQCT collected recipes and information about the region from Southern Queensland Country locals, operators and past visitors. These stories were collated into a twenty-page e-book with a strong, cohesive design and visual elements that could help travellers learn about the region. Most importantly, every part of the e-book was designed to be pulled apart and shared across social media and digital platforms as smaller pieces of content. These pieces included individual recipes, local travel tips and even the map which clearly illustrated the different parts of the region. By doing this, Southern Queensland Country Tourism were able to reach even more potential travellers and tell the story of the unique experiences on offer. Not only a success in terms of downloads, the e-book served as a unique piece of visual content to help users better understand the region. 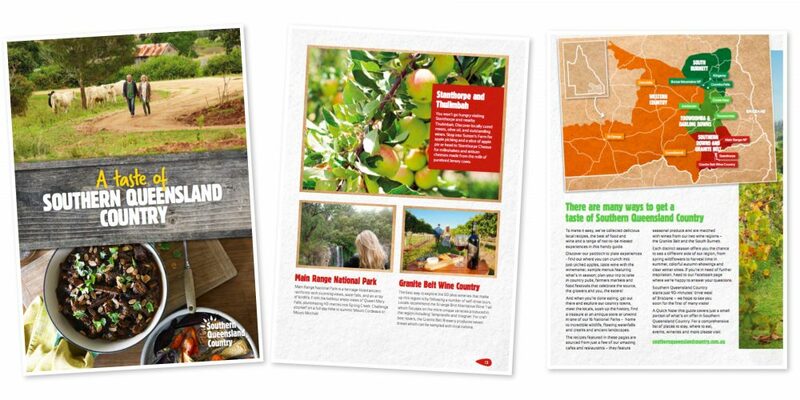 Readers can download 2016’s A Taste of Southern Queensland Country here. Creating effective visual content is vital to guiding customers through the path to purchase, especially at the awareness and consideration stages. But a pretty picture of a destination can only do so much. Consider incorporating maps, infographics, how-to guides, e-books and even recipes into your content strategy to help users better understand your destination, and even choose to go there next. How does your destination use visuals to engage your community and educate potential visitors? Tell us in the comments box below. Destination Think!’s international team helps DMOs like SQCT, Destination British Columbia, Destination Cleveland develop and execute confident destination marketing strategies. Click to see the impact we’re making.